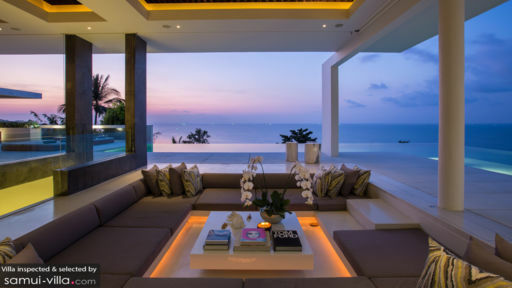 A trendy and edgy architecture resonates with Celadon Villa, perched atop a hill in Bang Po beach with its contemporary décor and interiors highlighting the luxurious aspects. The four-bedroom holiday home is ideal for a lavish, relaxing, and a much-needed break away from the monotony of life. With calm, pastel tones found in the bedrooms and living spaces, the villa celebrates a calming and tranquil time beside the ocean, where guests can take it easy, relax in the pool, spacing out to the stunning view as they rejuvenate their mind, body, and soul. Four, stunning bedrooms are found at Celadon villa and each is done up in a calming, pastel color palette to ensure that you have a relaxing time. With sliding glass doors leading to the patio and offering spectacular views of the ocean, you can rest assured that you are bound to enjoy staying indoors as well. Two of the bedrooms are furnished with double beds, while the other two are furnished single beds that can be joined upon request. If needed, the staff can also provide an extra children’s bed at no added cost. Each of the four bedrooms has an en-suite bathroom with a lavish, circular freestanding bathtub along with swivel windows looking out to the pool! 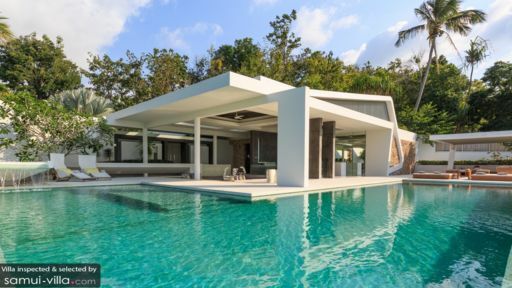 A remarkable exterior makes Celadon Villa stand out amongst the rest also affording the guests the luxury to enjoy views of neighboring islands as well as Ang Thong Marine Park. 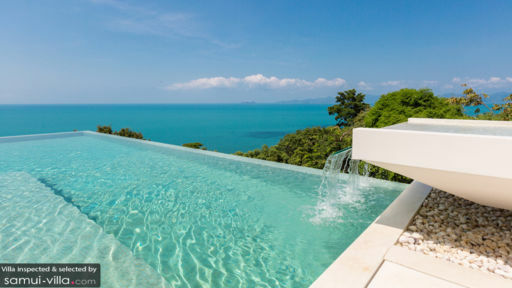 The magnificent 16-metre infinity-edge swimming pool is fed by a sleek tip supported on a pebbled surface to create an aesthetically pleasing view to enjoy all day. The blue ocean and the green vegetation is absolutely breathtaking and quite easily, one of the best in the land. A sala with a well-lit interior for a glorious and enchanting ambiance is found beside the pool, which houses a sunken sitting area with comfortable sofas, cushions, and a coffee table perfect for relaxation. Daybeds and sun chairs are also a plenty on the pool deck. Beside the outdoor sala with a cozy lounge area for everyone to gather and enjoy a heart talk or to simply relish the beautiful ambiance, there is another outdoor living space under a pergola roof which is furnished with pristine, white couches, stools, and a coffee table, for guests to lounge on without a worry in the world. Once the sun sets, the entire outdoor space lights up beautifully so you can truly take in the mesmerizing scenes and have a wonderful time with your loved ones. Just beside the sunken sitting lounge, guests will also find the eight-seater dining table housed under the same roof for an alfresco dining experience. Celadon Villa celebrates the beauty of nature to the utmost by giving you a chance to breathe in the fresh air and enjoy the soothing and meditative atmosphere of Phuket. The kitchen is another lavish space with white and wood being the main contenders for décor, and it is fully-equipped with all modern amenities. With a dedicated team of employees to look after your needs and requirements, you have absolutely nothing to worry about. The in-house chef is happy to cook up a storm and prepare delectable meals for you at a minimal cost of the ingredients. The staff can even offer up recommendations on where to visit and what to do around the island! The famous Bophut Fisherman’s village is minutes away from the villa and so is Chaweng with its popular restaurants and shops to be explored. There are numerous restaurants around the villa as well like Haad Bang Po specializing in its seafood!